Cal described why he sometimes gifts Gabriel Garcia Marquez's "One Hundred Years of Solitude" to would-be writers: "If you've never written a book and you're going to tell somebody you want to write a great book, all right. Read this and know what a great book is". When asked what books he would recommend to young people interested in his career path, Emi Gal mentioned One Hundred Years of Solitude. My favorites [novels] are 100 Years of Solitude, All the King's Men, The Last Samurai, and Fear and Loathing in Las Vegas. 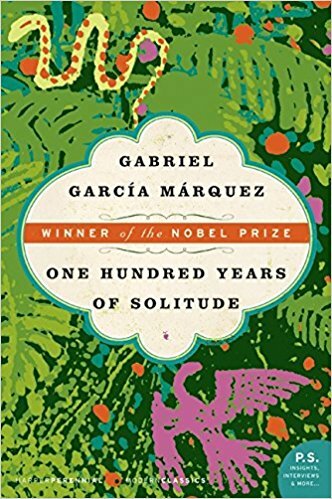 Brace yourselves—One Hundred Years of Solitude by Gabriel García Márquez is as steamy, dense and sensual as the jungle that surrounds the surreal town of Macondo! I’m Reading Gabriel Garcia Marquez’s One Hundred Years of Solitude, hell of a writer.